We manufacture Diffrent designer Flock stikcers for your walls made from high end long lasting material with glossy finish. Apply them on your walls and add texture to your walls. We have achieved a prominent place for presenting a varied range of Flock Transfer. Our company holds immense experience in this domain and is involved in offering wide assortment of Flock Transfer Sticker. Our Flock Stickers are used for adding creative designs or to do products or organizations promotion on garments T shirts etc. - precision-aligned fiber coating with flock fibers aligned straight up from base film. Our expertise has enabled us to offer our clients with a vibrant collection of Flock Transfer Stickers. The stickers offered by us have gained wide appreciations for an impressive 3D flock effect. Our offered stickers are non-toxic and hence safe to use in children wear, toys, sports wear, women wear and knitted sweaters. Nylon, Polyester or Viscose fibre. - 0.2 mm to 3.0 mm length. - Special character like hydrophilic or hydrophobic. Our expertise has enabled us to offer our clients with a vibrant collection of Flock Transfer Stickers. 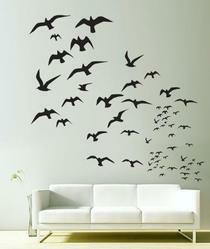 The Flock Transfer Stickers offered by us have gained wide appreciations for an impressive 3D flock effect. Our offered stickers are non-toxic and hence safe to use in children wear, toys, sports wear, women wear and knitted sweaters. We are a renowned name offering a wide variety of write and seal stickers to the clients. Offered at highly competitive prices, these products are provided in-tune with the exact demands and needs of the clients. Products offered by us are made up of using high quality raw material and are widely used in diverse markets for perfect brand identification tool.